I have some good news for you. You have a life plan! Your idyllic paradise has been carefully conceived and is awaiting just a couple more laws and regulations to be hammered out before given to you. The bad news is that your life plan is being planned by someone else. Your paradise is not of your conception, nor perhaps even to your liking. It is artificial, imposed by the CEO’s of AP, Inc.
“Agenda 21 is a guide for business and government policies and for personal choices into the next century. It was endorsed by the 1992 Earth Summit in Rio de Janeiro, Brazil, the largest-ever meeting of world leaders. They were joined by hundreds of officials from United Nations organizations, municipal governments, business, scientific, non-government and other groups. Nearby, the `92 Global Forum held a series of meetings, lectures, seminars and exhibits on environment and development issues for the public. This drew 18,000 participants from 166 countries, as well as 400,000 visitors. There were 8,000 journalists covering the Rio meetings, and the results were seen, heard and read about around the world”. These people sure know how to throw a party, don’t they? This shindig makes AIG spa-oriented conferences look like child’s play! All of this effort on your behalf, isn’t that nice? I am particularly touched by the fact that over 8,000 journalists were present; they all must have been from the New York Times, MSNBC, and Times Magazine; because I never heard a word about Agenda 21 until recently. As long as this article will inevitably be, it is merely the tip of the iceberg. Agenda 21 encompasses every aspect of your life, and each topic has produced many books on its own. Energy, biodiversity, climate change, governance, eco-responsible business, consumption, fossil fuels, water, food, poverty, etc etc. Agenda 21 is an entire blueprint for re-structuring society on a global scale, and as such, is a daunting task to try to convey its importance and magnitude in some blog-friendly format. Agenda 21 proposes an array of actions which are intended to be implemented by every person on Earth…. It calls for specific changes in the activities of all people…. “Effective execution of Agenda 21 will require a profound reorientation of all human society, unlike anything the world has ever experienced – a major shift in the priorities of both governments and individuals and an unprecedented redeployment of human and financial resources. This shift will demand that a concern for the environmental consequences of every human action be integrated into individual and collective decision-making at every level”. Source: The Global Biodiversity Assessment Report by the United Nations Environment Programme (UNEP) *Bold text indicates items that are being addressed in current or pending legislation. As I am sure you are aware I have been using Artificial Paradise, Inc. in a satirical manner, but there is a real life corollary, an organization called The Club of Rome. The CEO’s of AP, Inc. are really the Board Members of the Club of Rome. Members from this organization have been the principle players in developing what was to become Agenda 21, and they remain quite active in their role to implement it. When I referred to the subsidiaries of AP, Inc. I was making reference to the 58,000 organizations registered with the United Nations that are committed to promulgating Agenda 21. 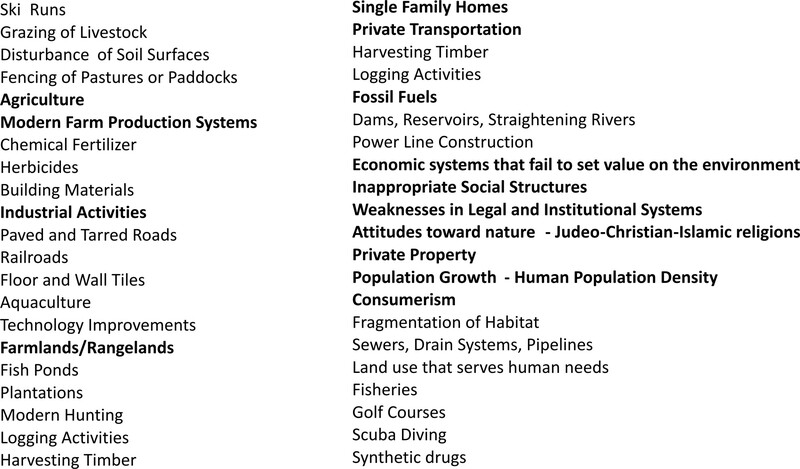 Inasmuch that Agenda 21 is a comprehensive re-structuring of society, each of these organizations dedicate themselves to certain aspects of Agenda 21. These ‘non-government organizations’ (hereafter referred to as NGOs) can be think-tanks, policy recommendation consultants, advocacy groups, educational/spiritual organizations, or agencies that work on behalf of central governments to help implement policies on a local level. The perfect vehicle was born! Humans can all equally live with existential guilt. Climate itself has no national borders, so ‘death by climate’ is perfectly suited to impose restrictions on all humanity via a global governance program. Twenty years of getting man-made climate change ingrained into the worlds mind as some globally accepted truth, led other CoR members to speak out and strengthen the message, giving rise to the Framework for Paradise-Agenda 21. Agenda 21 incorporates within it all preceding language from various UN land, environment, biodiversity, social, and economic reform programs. Last year at Copenhagen it was hoped that all nations would legally bind themselves to Agenda 21 by signing the UNFCCC. I know many people were greatly concerned that Obama would sign this treaty, but I knew he would not because he had absolutely no need to do something so overtly when Agenda 21 is, and has been, in full operation in the United States ever since G.H. Bush signed it in 1992. Although Agenda 21 is not a treaty and therefore is not legally binding, it hardly makes any difference if the policy is adopted and incorporated into every Federal Agency and is the driving force behind all policy and legislation. In order to re-educate the world (and our children) the Earth Charter runs concurrent with Agenda 21 so as to indoctrinate the world consciousness to embrace ecological stewardship and global citizenship. The Earth Charter was adopted by UNESCO and signed by G.W. Bush in 2000. The Earth Charter also helps foster the notion of Mother Earth as the Supreme Deity. There are literally 1,000’s of NGOs dedicated to this singular purpose. The program for implementing the Earth Charter is called the Earth Charter Initiative . Following are just a few of these ‘initiative’ NGOs that have been created by Club of Rome members. To embed the policies outlined in Agenda 21 into our society, Clinton established The President’s Council on Sustainable Development in 1993. The PCSD then hired the APA to develop guidelines of legislative actions. They published this handbook in a tome entitled ‘Growing Smart’. Today, smart growth is a common term in our society. In fact, if you put the words smart growth into your browser, it will return about 8,000,000 hits. Similarly, if you enter the words ‘sustainable development’ into your browser it will return you 25,000,000 hits! Agenda 21 is very embedded into our country! To facilitate the propagation of Agenda 21 (and basically change the nature of law in this country) he had amended the Federal Advisory Committee Act. This law governed the way NGOs interacted with the White House and Congress to help write and implement policy. These NGOs then serve as the interface between Government and Society. Simply stated the rules regulating NGOs basically equate to something like this: “I will hire you to give me a report that will prove man has created climate change, and then you must help champion my idea if you are to retain your consultative status with Congress”. The IPCC is such an NGO. NGOs that have obtained consultative status with the United Nations are called Civil Society Organizations, or CSOs. The United States government maintains a database of 1,000 accredited NGOs at any given moment. Of all of these 1,000, each of them is a CSO. There is not a single organization representing America or American citizens that have consultative status. This explains why you have never heard from any of the myriad of scientists or scientific organizations that say ‘man-mad climate change’ is a hoax. They have no voice, no federal grant money, and in many cases no further career if they become too vocal. USDA: “The U.S. Government has joined with foreign governments, international organizations, non-governmental organizations, academia, and the private sector to plan and implement voluntary partnerships that promote economic growth, social development and environmental stewardship. For example, at the World Summit on Sustainable Development held in Johannesburg, South Africa, in 2002, the United States established and/or joined more than 20 partnerships to advance sustainable development. In addition, USAID, operating under the new Global Development Alliance (GDA) business model, has initiated or significantly expanded more than 200 public-private alliances in 2002 and 2003″. “The United Nations recently passed a resolution on partnerships, “Towards Global Partnerships” (A/RES/58/129), and additional information regarding international sustainable development partnership efforts may be found at the UN’s Commission on Sustainable Development“. EPA: “The United States government is extensively engaged in international climate change activities in areas such as science, mitigation and environmental monitoring. EPA actively participates in multilateral and bilateral activities by establishing partnerships and providing leadership and technical expertise. Multilaterally, the United States is a strong supporter of activities under the United Nations Framework Convention on Climate Change (UNFCCC) and the Intergovernmental Panel on Climate Change (IPCC)“. Lets look at a few chapters from Agenda 21 and see how they are being applied today. If you want to predict your future, all you have to do is just glance over the names of all 40 chapter titles and it would be as if you are in possession of a crystal ball. Combating poverty: One of the first things Obama did when he took office was get the stagnant Global Poverty Act passed. This obligated the United States to pay the United Nations an additional $65 billion annually to help combat poverty. Although I am not aware of this country ever receiving foreign aid to help combat our poverty (or crises), we continue to pay through the nose to everyone else. There are many aspects to this that a thorough analysis would uncover, but suffice it to say this is also an instrument being used to re-distribute wealth. New taxes are about to be imposed on U.S. citizens by the U.N. that will go into affect in 2012. Additionally, in each chapter there is mention of helping to combat poverty in developing nations. The U.S. has been giving away our money for decades in this effort, and it typically ends up in the pockets of some UN leader or corrupt third-world tyrant. Irrespective of the fact that military analysts continually say we cannot win the war in Afghanistan so long as the leadership is a corrupt regime, no one seems to be apply this same logic to the war on poverty. I find that curious. Changing consumption patterns: This sounds rather innocuous until you consider the scope of what consumption means. In other words; everything you eat, drink, buy, or use. An example of some regulations and legislations that will serve to greatly restrict our consumption patterns are Cap and Trade, the Smart Grid, The Food Modernization Act and many more EPA and USDA regulations about to be enacted. Our behavior is to be modified via an endless stream of taxes and punitive damages. I am not going to delve into dissecting legislation so I will use as an example of this Obama’s own words: “your energy prices are by necessity going to go sky high”. It is the intent to make fuel, energy, water, food, etc. so expensive that people will curtail their consumption. Children and youth in sustainable development: “Youth comprise nearly 30 per cent of the world’s population. The involvement of today’s youth in environment and development decision-making [this means getting their vote] and in the implementation of programmes is critical to the long-term success of Agenda 21″. Anyone that watches the news is acutely aware of how our children are being indoctrinated to embrace new values and perspectives. Our leaders are undermining the family unit as they repeatedly tell our children that they know better than their parents. I have already provided links to some of these sites, as well as mentioned the Earth Charter, which is the massive educational re-programming of the youth. Al Gore founded 2 such organizations himself: The Climate Project and The Climate Alliance. The latter organization is a brilliant psychological construct that uses peer group identification processes. Strengthening the role of non-governmental organizations: “Involve non-governmental organizations in national mechanisms or procedures established to carry out Agenda 21, making the best use of their particular capacities, especially in the fields of education, poverty alleviation and environmental protection and rehabilitation. Review government education systems to identify ways to include and expand the involvement of non-governmental organizations in the field of formal and informal education and of public awareness. Governments will need to promulgate or strengthen, subject to country-specific conditions, any legislative measures necessary to enable the establishment by non-governmental organizations of consultative groups, and to ensure the right of non-governmental organizations to protect the public interest through legal action”. This seems pretty self-explanatory, and when considered against the light of how Clinton amended FACA and made massive changes to the processes of awarding grants, it illuminates with much more clarity how a non-elected quasi-government has gained so much control over our lives. Strengthening the role of workers and their trade unions: “The existing network of collaboration among trade unions and their extensive membership provide important channels through which the concepts and practices of sustainable development can be supported”. Obama promised the Unions he would pass the Employees Free Choice Act which will in essence unionize every company in this country with 3 or more employees without due process of a voting procedure. Not only will this serve immediate political interests, but it is also helping to to take ‘community organizing’ to the next level; ‘global organizing’. Promoting education, public awareness and training: “Education, including formal education, public awareness and training should be recognized as a process by which human beings and societies can reach their fullest potential. Education is critical for promoting sustainable development and improving the capacity of the people to address environment and development issues. While basic education provides the underpinning for any environmental and development education, the latter needs to be incorporated as an essential part of learning”. Integrating environment and development in decision-making: “The responsibility for bringing about changes lies with Governments in partnership with the private sector and local authorities, and in collaboration with national, regional and international organizations, including in particular UNEP, UNDP and the World Bank”. A massive re-distribution of wealth is taking place right now, and right under our noses. This chapter is dedicated to expounding on the processes of strengthening Public-Private Partnerships, or PPPs. The way this works is that your tax dollars are given to companies to help underwrite the costs of developing some enterprise, and then the profits are split between the Government and the Corporation – (you don’t get any share of the profits even though it was your money that was used). Like NGOs, you have to be an entity that is on ‘the team’ in order to get this federal help. In short, this is one giant circle of collusion. In order to survive in the future, your company must be on The Green Team. An excellent example of this is Whole Foods, Inc. You may recall how Whole Foods CEO John Mackey spoke out vehemently against the Health Care Bill. Garnering the wrath of the Left and the scrutiny of the Federal Government was not serving his business objectives to well, so he decided to ‘play ball’. Here is a link to his new “sustainable” website: Catalyzing Conscious Capitalism. Learning how to ‘play ball’ in the 21st century has produced a plethora of publications and toolkits that NGOs have been hired to produce, (paid for by taxpayers in the form of grants). Here is one example: Environment, Ethics, and Business. As a foundation for my fanciful ruminations, there are some immutable facts that continually gnaw at me. The Chicago Climate Exchange proclaimed on TV that they are anticipating annual sales of $10 trillion. Al Gore’s company, Generations Investment Management, states on his website that they anticipate annual sales of $13 trillion. Pondering the magnitude of these numbers is mind-boggling when you consider that the entire worlds annual GDP is $69 trillion! In other words, these 2 companies alone (which are predominately owned by Club of Rome members) anticipate sales that equal 1/3 of the entire worlds wealth! It also came as a surprise to me that revenues from Cap and Trade have already been accounted for in the 2012 budget. This law has not even been passed as yet, but it seems that these people have considered it to be a foregone conclusion. Indeed, the Chicago Climate Exchange was conceived 10 years ago as a way to capitalize upon emissions that Cap and Trade will regulate once passed. Makes me wonder what ever happened to democracy. Makes me question all this noble sounding rhetoric about offering people ‘choices’. The objective of our Administration under the guidelines of Agenda 21 is to have everyone hooked up to the smart grid and living within defined boundaries designated for human habitat, comfortably ensconced within their little eco-habitat. Smart Growth is currently being implemented in 1,408 cities in the US by a CSO called ICLEI (International Council for Local Environment Initiatives). The ultimate goal is to build sustainable cities and preserving as much land as possible while protecting the air through the limitation of private transportation. In order to engineer the population into these pre-designated zones of habitation, the US government is taking over our land at an alarming rate even though there is no constitutional basis for government ownership of land other than to establish military bases. Currently the government owns 650 million sq acres of our land with another 300 million acres about to be claimed via Wildlands Projects. Additionally Obama has put into motion claiming land by using the Antiquities Act and establishing protected heritage sites. Ironically enough all the land the government is claiming just happens to be where all our agriculture is, our minerals, water, oil, and other valuable resources. We are being led to believe that it is only the lacking of our spiritual enlightenment that prevents us from seeing the beauty of life confined so we can co-habitat in symbiotic bliss with bugs and furry little creatures while a higher communal harmony can be achieved by our shared love of our Goddess Mother Earth. The Aquarian Age Community within the United Nations is at this moment debating who shall be our new spiritual leader. You might find it of interest to read their article on their vision for a New World Order. Welcome to paradise. Have a nice day!